Scoopy Poo Doggy Doo Pick Up is changing what it means to be scooped. Minneapolis, MN. 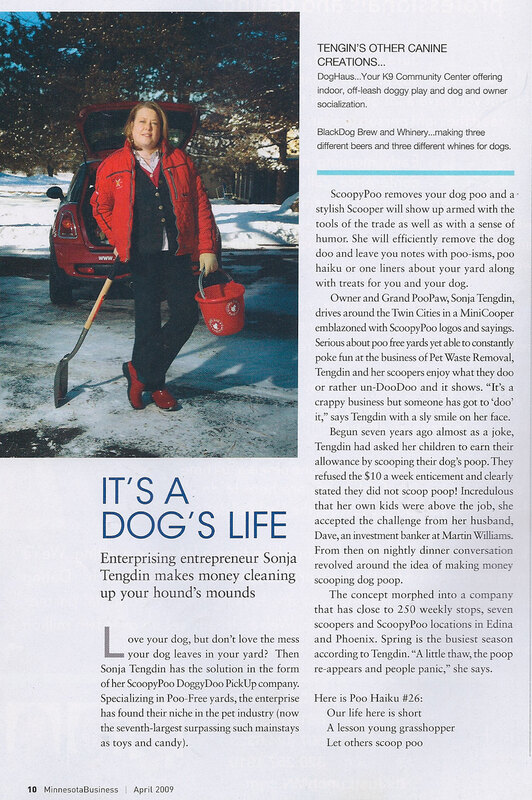 June 20, 2008 – Scoopy Poo is setting new standards for customer service in the dog waste removal industry by turning a “down to earth” job into a glamorous profession by scooping dog waste from back yards with a smile and a smashing wardrobe. Unsatisfied with the grub and drudgery that many other waste removal companies focus on, Scoopy Poo took a different direction taking pride in their poop scooping by showing up to clients’ homes to scoop poop dressed in fancy attire characterized as trendy and stylish. The company was started in 2002 by Sonja Tengdin, a former bond trader and busy mother of two boys and two dogs, got the idea while sitting down in her backyard to enjoy a drink with long-time friend, Gene Horstman, and noticed that the unbearable stench of the dog poop she had neglected to pick up for weeks was spoiling what was to be a relaxing moment. A few jokes later, Scoopy Poo was born. “We have a mission to ‘un-DooDoo’ the world, one yard at a time. And showing up in style means we’re taking our mission seriously, while never taking ourselves too seriously. We are visiting our customers’ property once or twice a week. We’re not only helping them keep their yards clean and healthy, but also representing them in front of their neighbors in their communities. We want to do that in the best possible light,” said Stengdin. Scoopy Poo considers themselves to be the clean sweep team for conscientious homeowners with one or two dogs, or condos buildings with several dogs sharing a small space of land, who are generally neat and tidy, but may have little time to spare to keep their yard clean and free of dog waste all the time. Benefits to using the service include making lawn mowing easier and avoiding poop being tracked into homes by pets or children. And in the summer months, a waste-free yard keeps away extra bugs and off-putting odors that can spoil the atmosphere of backyard parties. But perhaps the biggest benefit is preventing the danger of infectious bacteria and parasites that can be passed to dogs and humans, including tapeworms and roundworms and bacteria including salmonella and giardia. ABOUT SCOOPY POO Scoopy Poo is a Twin Cities-based dog waste removal company who specializes in cleaning up residential homes, condos, townhomes and commercial properties. They are famous for being the first to glamorize the job of poop pick up and can often be seen year-round in back yards and at properties around the Twin Cities dressed to impress. They currently have offices Edina and Phoenix serving full-time Twin Cities residents as well as Minnesota snow birds.